Tomorrow is the big day -- the Fourth of July! This was my dad's absolute favorite holiday, so this special time of year is filled with a lot of reminiscing. Today Mom and I begin baking for our celebration -- Mississippi mud cake, blondies, blackberry pie, red velvet cake balls, and flag cupcakes! It is gonna be good. 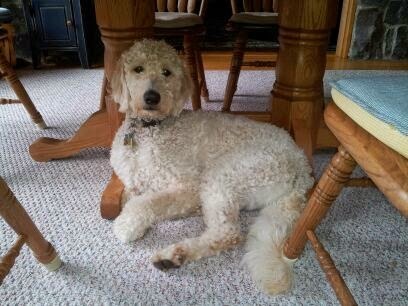 Underfoot is a good way to describe our goldendoodle - the Milt. He always likes to be around the action, and I am certain that he will be sniffing and licking his way all throughout the kitchen today. Happy Third of July, everyone; enjoy the fireworks tonight!